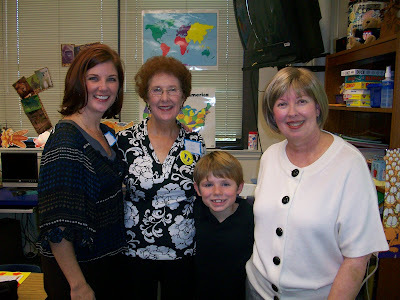 Tuesday was "Great Friends Day" at Little Man's school. 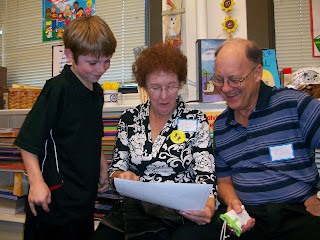 This day used to be called Grandparents Day, but because so many kids had grandparents who live out of town and couldn't come - they widened the parameters of the event a couple of years ago for more general inclusion. So, a "great friend" can be anyone. The kids had created a cute video presentation with pictures of their families they created on the computer which were voiced over by them reading copy they had each written about "Why I am Thankful". Then each child introduced the people who were there for them. Mom's boyfriend/partner/love muffin came (to earn some brownie points with Mom) so Little Man had three representatives - he was duly represented. 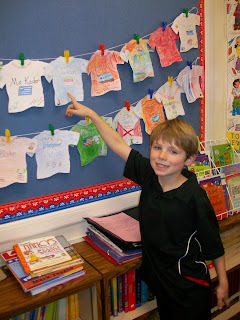 After the presentation, you wandered around the classroom looking at their artwork and visiting with other families. The kids were so excited to have their "great friends" there.